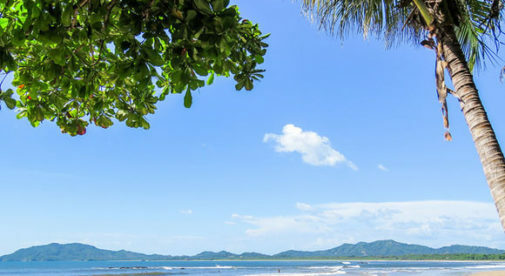 We found that warm weather—and then some—along Costa Rica’s Gold Coast, spanning the northern Pacific coastline, specifically in the popular surf town of Tamarindo. Costa Rica has two seasons: wet and dry (you may also hear them referred to as winter and summer, or green and dry). However, in the Guanacaste region, where Tamarindo is located, you will experience even less distinct seasons than anywhere else in the country. While the wet season technically lasts May through October, intense rains will only typically roll through in September and October. Even at that, a day without sunshine is rare. It’s more common to experience a heavy afternoon rain that stops just in time for sunset, a morning shower with the sun making its appearance again after lunch, or a good downpour through the night while you’re asleep. When people ask me what I love most about living here, I tell them it’s the sunshine every day of the year. If you like the thought of never wearing long pants, a jacket, or even a sweater, then Tamarindo is a good option. With the exception of a day here or there where it will dip slightly below, or rise slightly above, temperatures in Tamarindo range from 80 F to 90 F throughout the entire year. After enduring so many years of winter, I always tell people, I’d rather be a little sweaty than have to bundle up. Nothing a quick dip in the refreshing, Pacific water can’t fix! I now lead a lifestyle where the need to check the weather is obsolete. I know I can throw on a pair of shorts and a tank top, or a sundress and a pair of flip flops, walk out the door any day of the year, and be perfectly comfortable. A dip in the ocean brings me to my next perk. What is the point of living near the water if you can’t swim without your lips turning blue? While my home state of Michigan boasts the magnificent Great Lakes and some pretty amazing beaches, there are only a select couple of months out of the year where the water warms up enough to swim and enjoy. Here in Tamarindo, the consistent, tropical sun keeps the water tepid all year. Cooler than the air, the water is still refreshing, but you don’t need to spend any time inching in or “getting used to it,” to be comfortable. Mornings and late afternoons are crisp enough in Tamarindo to allow for a run, bike ride, or hike. Evenings are cool enough to have a barbecue with friends, but by no means will you catch a chill in the night air. Middays are sunny and hot; a great opportunity for a refreshing beverage under a shade tree or a restful siesta inside with the ceiling fan or air conditioner. While it may not be perfect for everyone, it’s pretty perfect for me.